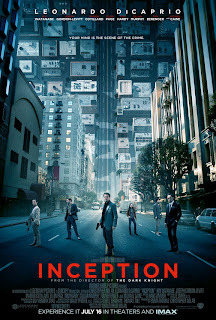 First and foremost, 'Inception' lived up to the expectations I held for it. And they were pretty darn high. Chris Nolan, with this original piece of filmmaking has set himself apart from just being "the guy who made The Dark Knight". This film, while not being as complicated as you may imagine. actually has the tone of a bank heist film. Of course the difference here being that in 'Inception' the bank is the mind and the team of robbers aren't stealing as they would usually do, but instead they are leaving something behind. It is a grand idea and Nolan explores it without losing anyone. Though he does assume his audience is smart enough to keep up, something we haven't really had to do much of this summer. This may be the most refreshing aspect of the film, that in a season filled with uninspired sequels, unnecessary remakes and plain ole lazy movies it is nice to see a movie that challenges its audience while never failing to entertain it as well. But back to the concept that makes this film engaging from start to finish. This, for me, is what movies are all about-a spectacle for the eyes and ears while enticing the viewer with a story that truly makes them think beyond the scope of what the films discussion offers up. There is no point in attempting to describe the plot of the film, it is one you must see for yourself and as you may have heard, come to your own conclusions. There are points in the film that we have figured out pretty early on, and we are fortunate to have Ellen Page on our side as she asks alot of the questions we ourselves are wondering. Speaking of Page, she does a wonderful job here. I wasn't sure how her quirkiness would fit into Nolan's epic action drama or how well she would mesh with the seriousness of DiCaprio, but she pulls it off well and is truly the one that forces the action forward and reveals layers of the story we may not have known had she not been present. As for DiCaprio himself, this feels a little redundant seeing as we just saw him in 'Shutter Island' playing the emotionally crippled widow. I have always been a fan of his though and had these movies not come out so close together it seems he would be getting more praise for his commanding performance. The casting is superb-if there were only time to go on about how effective Joseph Gordon-Levitt was or how charismatic Tom Hardy was; as well as Michael Caine, Ken Watanabe and Cillian Murphy lending their great talents to slightly smaller roles. Marion Cotillard is quickly becoming one of my new favorite actresses, and here she plays the obstacle of Leo's subconscious and offers a real glimpse into how far in depth Nolan went with his thinking and scheming of the ins and outs of what it would take to in fact enter someones mind and create an alternate reality. 'Inception' asks some big questions-How do dreams come to us? Where does the origin of an idea come from? What makes our dreams any less real than what we perceive as reality? It is some seriously deep stuff and the final shot will no doubt have you debating with your friends for days after. 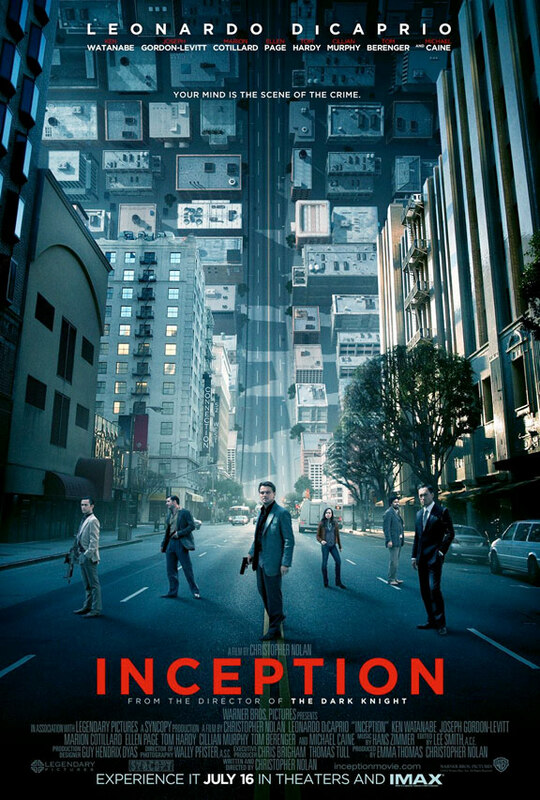 In the end, as puzzling as it all may sound, 'Inception' makes sense and it is beautiful to witness (especially on the IMAX screen). The gravity defying fight scenes are elaborate and elegant, the snow-coated mountain shootouts are glorious and they are all built with a great tension that counts us down to that moment when everything has to be accomplished and the players must exit the dream. It is amazingly shot, perfectly edited and the best movie I have sen so far this year. It is an epic that deserves to be recognized for its thought provoking concepts. It is a movie that only comes along once in a great while.